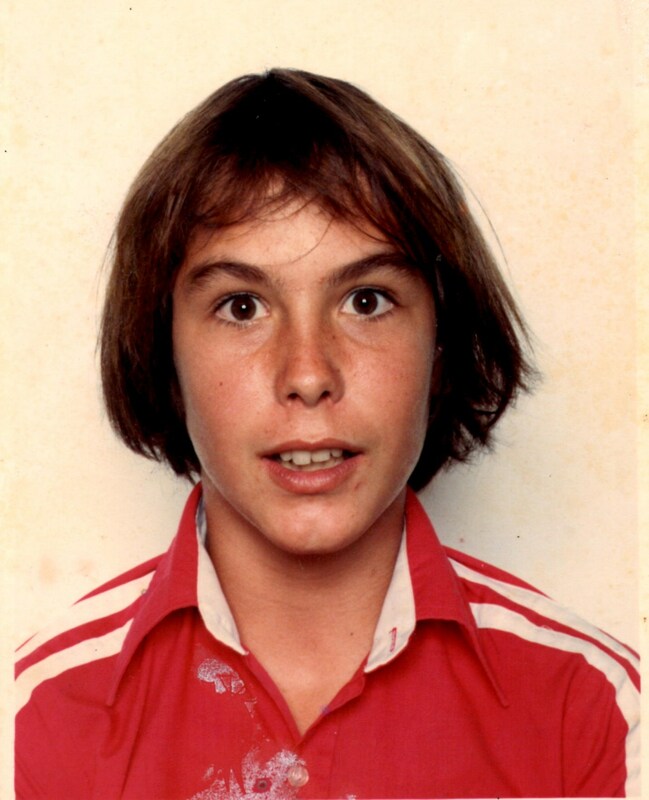 This is a photo of my little brother Matty, taken in 1980 or 81 when he was 12 or 13 in the first year at high school. When this picture was taken he’d already started smoking dope, as had most of his friends. A couple of years later Matty was diagnosed with full-blown schizophrenia. He killed himself not long after his twentieth birthday. Thrill Seekers is dedicated to his memory. Matty and I were very close, only 17 months apart. I don’t remember ever feeling jealous of him or us competing for our parents’ attention. No sibling rivalry. In a snapshot taken when my mother first brought him home from the hospital I look as if I’ve just been given the most wonderful present, my own real live dolly to look after. We were good mates – the “biggies” to our younger siblings “littlies”. Matty wasn’t much chop at school but he was amazing with his hands, particularly anything mechanical. He loved animals and they loved him. One day he clambered over the fence at Lone Pine Koala Sanctuary and cuddled a wombat! He was always a risk taker. At the age of two he found Dad’s car keys and took us both on a joy ride that almost took us over a cliff. He was lots of fun. Matty started smoking dope before me. I was worried but it seemed harmless enough. I know better now. Many researchers are stuck in the “what came first the chicken or the egg” conundrum, arguing that people with a predisposition to mental illness are drawn to cannabis and other drugs in an attempt to self-medicate. I’m not. Matty may have had a predisposition to schizophrenia (one of our father’s cousins had the disease) but surely not all of his mates did too. Anyway, these guys were 12 and 13 years old. They weren’t self-medicating, they were playing! They’d have a smoke and play war in the long grass by the horse’s paddock or race remodelled dragsters through squirted hose water; then head up the corner shop to feast on Twisties and lollies. They were kids. The statistics say that the chance of developing schizophrenia is one in a hundred. If there’s a relative then your odds up to 6%. But what I saw was not just one of those boys going mad – Matty was only the first. It wasn’t two of them. Not three. But MOST of them. Upping their odds to around 90%. Even those who managed to escape full blown psychosis still wrecked their health and happiness because of the destructive power of their addictions. It isn’t just sad, it’s a tragedy. All these young men killed and damaged, as if there’d been a war. Researcher Professor Robin Murray has found in a recent study that people are 4.5 times more likely to be schizophrenic at 26 if they were regular cannabis smokers at 15, compared to 1.65 times for those who did not report regular use until age 18. The risk is much greater the younger you start using. It wasn’t, and isn’t, just Matty and his mates but other clusters of kids in developed societies all over the world. Boys, and girls too, mucking around, being tough, playing cool, searching for thrills and instead finding only the torture of mental illness. Further criminalisation of cannabis isn’t the answer. It hasn’t worked. It won’t. Kids need to know what they’re risking when they start having bongs for breakfast. They need to know there’s nothing cool about going crazy. For further info or support see these sites. Great post, Edwina. So sad to see that photo and to think of Matty smoking dope so young. THink I might pass this one of to a few people. Good for you. Never heard that story about the car trip … two years old???? ?